The cell. 2. Extracellular matrix. Carbohydrates. Atlas of plant and animal histology. In animal tissues, cells are surrounded by collagen fibers, elastic fibers, glycoproteins, and a large amount of non-branched polymers of carbohydrates, and water. These carbohydrate polymers are glycosaminoglycans, also known as mucopolysaccharides. In plant tissues, the main extracellular carbohydrate is cellulose, a glucose polymer, but glycosaminoglycans are not present. Figure 1. Molecular composition of major glycosaminoglycans (modified from Lamoureux, 2007). Glycosaminoglycans are unbranched carbohydrate polymers that can be very long molecules. They are composed of disaccharide repeating units containing an amine group on the first one (N-acetylgalactosamine or N-acetylglucosamine), whereas the second is usually galactose or glucuronic acid. Most of the hydration of extracellular matrix depends on glycosaminoglycans because water is strongly associated with the negative electric charges of carboxyl groups (COO-) and sulfate groups (SO3-), both being found in these saccharides (Figure 1). Glycosaminoglycan molecules occupy large volumes because their molecular secondary structure is quite inflexible providing, together with the high hydration, gel-like properties. Thus, It allows tissues with high proportioin of glycosaminoglycans to resist mechanical loads. Furthermore, the diffusion of molecules through the extracellular matrix is highly facilitated. 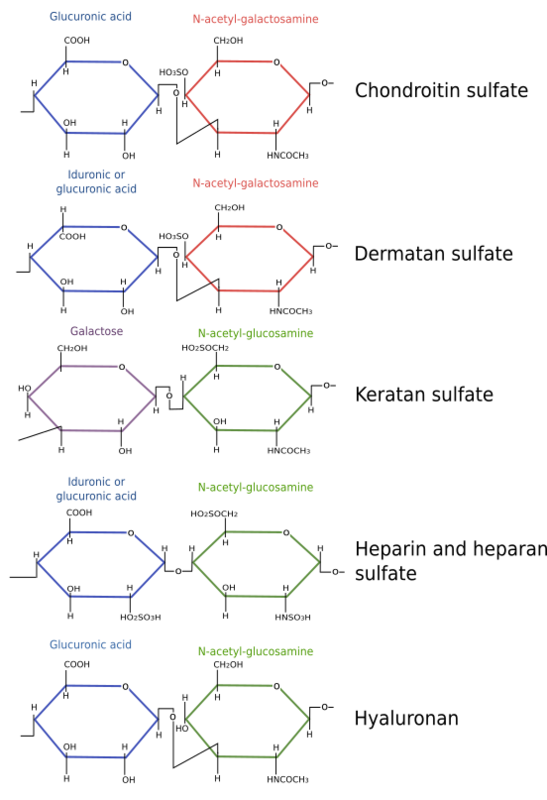 The most common glycosaminoglycans are hyaluronan and sulfated glycosaminoglycans, such as chondroitin sulfate, dermatan sulfate, keratan sulfate and heparan sulfate. Hyaluronan, also known as hyaluronic acid, is a distinct type of glycosaminoglycan. First, it does not bind covalently to other extracellular matrix molecules. Second, it is synthesized in the cell membrane, not in the Golgi apparatus. Third, it does not contain sulfate groups. Hyaluronan is made up of disaccharide units, D-glucuronic acid and N-acetyl-glucosamine, repeated up to 20000 times. It is usually associated to collagen and proteoglycans and provides elasticity, lubrication and resistance to tissues. These properties are needed during development and in those places of the body where a high rate of cell proliferation occurs because hyaluronan makes easier the cell movement and molecule diffusion. As a large and rather inflexible molecule, hyaluronan occupies a large volume and provides many free spaces. It is also abundant in those places with high friction forces such as joint cartilages. All glycosaminoglycans, excepting hyaluronan, contain sulfate groups and are covalently bound to polypeptides. Proteoglycans are molecules consisting of a polypeptide covalently bound to one or more glycosaminoglycan molecules (see below). Chondroitin sulfate is composed of repetitions of N-acetylgalactosamine - glucuronic acid and is abundant in cartilage and nervous tissue Dermatan sulfate is made up of repetitions of glucuronic acid (or iduronic acid) plus N-acetyl-galactosamine. Keratan sulfate contains repetitions of N-acetyl-glucosamine and galactose, with different kind of sulfation depending on the monosaccharide. Heparan sulfate is synthesized by most cells, and is essential for the basal lamina. It can be found linked to the cell surface by CD44v3 receptor, chemically bond to glycosyl phosphatidylinositol of cell membranes, and free in the extracellular matrix as part of proteoglycans like perlecan or agrin and to type XVII collagen. All these glycosamioglycans have many negative electrical charges that make frequent associations with chemocines or growth factors, laminins and fibronectins. Heparin is a heparan sulfate derivate release by mastocytes and used as anticoagulant. Heparin consists of repetitions of N-acetyl-glucosamine plus glucuronic acid (or iduronic acid), with different chemical bindings than those of hyaluronan. All these glycosaminoglycans are chemically linked to polypeptides and form macromolecular structures known as proteoglycans. Figure 2. Aggrecan proteoglycan (modified from Lamoureux, 2007). Different proteoglycans show different amino acid sequence and polypeptide length (ranging from 100 to 4000 amino acids). Furthermore, they contain a different number and types of glycosaminoglycans. 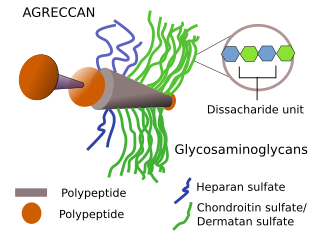 For example, decorin proteoglycan is made up of just one molecule of glycosaminoglycan attached to the polypeptide, whereas aggrecan proteoglycan contain more than 200 glycosaminoglycans. Proteoglycans can be classified in a number of groups. Lecticans show a globular structure in the N-terminal part of the polypeptide, which interacts with hyaluronan. It mainly contains chondroitin sulfate, and occasionally keratan sulfate. Aggrecan, versican, neurocan and brevican are members of lectican group. The SLRP group of proteoglycans contains many leucine amino acids in the polypeptide, which is bound to chondroitin sulfate and keratan sulfate. Biblicane, decorin, fibromodulin and keratocan belong to this group. Another major group of proteoglycans contains heparan sulfate. Most of them are free in the extracellular matrix, such as perlecan and agrine, and a few, such as syndecan and glypican, are inserted in the plasma membrane. A diverse group of proteins, such as CD44 receptor, amyloid precursor protein, and some collagen (IX, XII, XIV, XVIII), may or may not contain sulfated glycosaminoglycans, i.e. they are part-time glycosaminoglycans. The biological activity of proteoglycans strongly depends on the molecular weigth, number or disaccharide repeats and the type of bounds between saccharides of glycosaminoglycans. All glycosaminoglycans are negative charged, but the amount of negative charges is a major feature to understand their functions. The number of sulfate groups determines the overall negative charge, but how sulfate groups are sorted along the saccharide chain also determines the properties of the molecule and can make many different molecules. These functions are hydration, resistance to tensile forces, lubrication, help in cell physiology and motility, etcetera . For example, the mechanical role is essential in cartilage and joints. Furthermore, they act as anchoring points for cell attachment, either because the proteoglycan is part of the plasma membrane, can be linked to cell membrane phospholipids, or they are recognized by cell adhesion molecules like integrins, wich are transmembrane proteins. It is curioius that proteglycans are scarce in the stem cell niches. Sometimes, proteoglycans can work as a chemical and physical barrier. Perineuronal nets are parts of the extracellular matrix surrounding somata and proximal dendrites of neurons of the central nervous system. They contain many proteoglycans bearing chondroitin sulfate, like aggrecan, brevican and neurocan. These extracellular molecular coats may influence synaptic plasticity, and the formation of new synapses, and some neuropathologies are starting to be linked to damages in these nets. It is thought that perineuronal nets inhibit neuronal plasticity. Sulfated glycosaminoglycans sites where some charged proteins may be transiently retained. Sometimes, the interection of proteins with proteoglycans produces a conformational change that ends up in the activation or inactivation of the protein function. For example, heparin modifies antithrombin so that it can bind thrombin and X factor resulting in inhibition of blood coagulation. Another example is the conformational change of fibronectin that after the interaction with glycosaminoglycans exposes molecular domains to interact with other extracellular matrix molecules. Another function of glycosominoglycans is as co-receptors increasing the affinity between ligand and receptor. Cellulose is the main component of cell walls, the extracellular matrix of plants. Some authors do not include cell wall as a type of extracellular matrix, but here it will be studied as a highly specialized extracellular matrix. Cellulose is paracrystalline structure consisting of polysaccharides made up of glucose molecules (more than 500 per cellulose molecule) linked by β(1-4) bonds (Figure 3). About 50 cellulose molecules join together by hydrogen bonds and van der Waals forces forming structures known as microfibrils, which are oriented with the same polarity. Cellulose microfibrils are laterally linked together by hemicellulose and pectins to form cellulose fibrils and fibers. Fibers can be observed at light microscope. Figure 3. 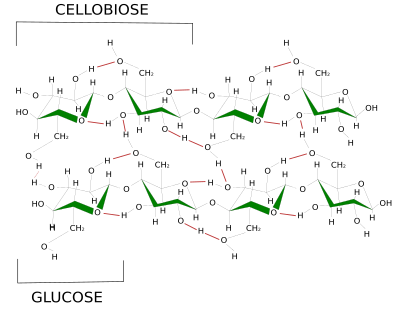 Arrangement of cellulose molecules and how they interact between each other by hydrogen bridges (red lines). Similarly to hyaluronan, cellulose is synthesized in the plasma membrane by the cellulose synthase enzyme, a transmembrane protein with 8 intramembrane segments (Figure 4). It takes glucose units from cytosol, makes them cross the plasma membrane, and chemically links them at the extracellular space. Up to 36 cellulose synthase molecules get together to form a macromolecular complex known as cellulose synthase complex, which can synthesize up to 36 cellulose molecules at the same time. As they are synthesized, cellulose molecules associate into cellulose microfibrils. Figure 4. Synthesis and orientation of cellulose influenced by microtubules. Cellulose synthase complexes move along the path delimited by the underlying microtubules (modified from McFarlane et al, 2014). An interesting question is how cellulose is laid over the cell membrane because the orientation of the microfibrils determines the orientation of cellulose fibrils. The growth of the body and the organs of plants is mostly a consequence of the increase of cells size, which is produced by hydrostatic pressure. Plant cells grow in the direction with a lower mechanical strength of the cell wall. The cell wall resistance is lower along the axis perpendicular to the cellulose fibrils. 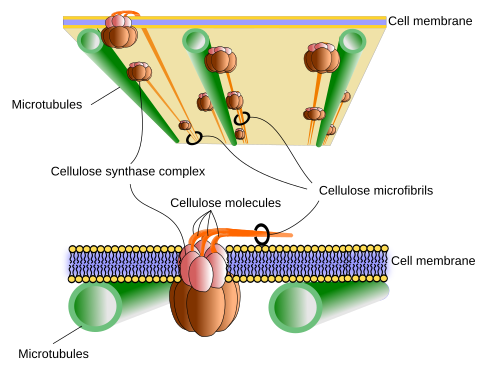 The spatial orientation of the microfibrils of cellulose over the cell membrane is determined by the movements of the cellulose synthase during the synthesis of the cellulose molecules, which in turn depends on the orientation of the underlying microtubules located just under the cell membrane. Microtubules are like fences that cannot be crossed by the large cellulose synthase complexes as these enzymes move while synthesizing cellulose molecules. Thus, by restraining the movements to certain directions, microtubules are responsible for the spatial orientation of cellulose fibers. There are other extracellular and intracellular factors influencing the movement of the cellulose synthase complexes. In this way, plants can control the growing direction of stems, leaves, and other organs of the body depending on the light, gravity or water. Besides the orientation of the cellulose fibers, cells can regulate the strength of the cell wall by other mechanisms like chemical modification of molecules like pectins or by acidification, that result in lower mechanical resistance places, so that cell enlarges through those areas.